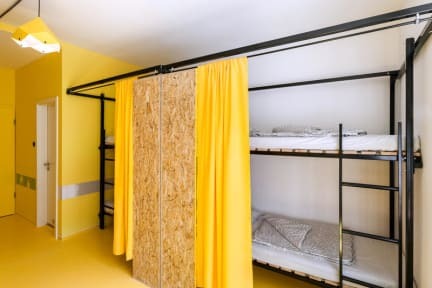 Essential Hostel offers private and dormitory accommodation in central Budapest, 200 yards from the St. Stephen's Basilica and a 1-minute walk from the leafy Szabadság Square Park. Free WiFi is available. Some rooms have a private bathroom, while others are provided with shared bathroom facilities. A shared kitchen, as well as a lounge with games and a TV with DVD Player are available for all guests. The Deák Ferenc Square Metro Station is 650 yards from the Essential Hostel . The Budapest Liszt Ferenc Airport is 10.6 miles from the property. The place is really accesible to the center, 8 minutes walking. The personal is very friendly and they will help you with what you need. Simply the best!! Was travelling around since many years but this staff and atmosphere is priceless. Location is great, next to the Basilica. They have free meals and also very knowledgeable free walking tours organized by the staff. Highly recommend! The hostel is in a super great location, friendly & helpful staff. However, the cleanliness of the bathrooms needed to be improved and I found hair in my bed before I even got into it. Otherwise, I had a great stay. 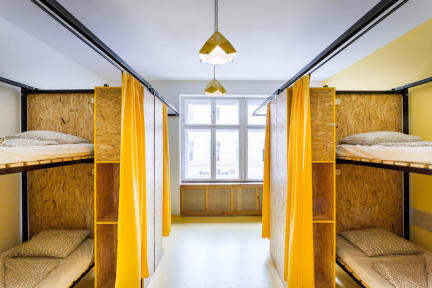 A very nice hostel, with pretty much everything included. We had a really nice stay, and wanted to stay longer, but it was fully booked that day. Would recommend. Genel olarak memnun kaldık. Giderken yanınızda dolap için kilit götürmenizi ve dolabın kilit yerinin düzgün çalışıp çalışmadığını kontrol etmenizi öneririm. Çünkü ben fark ettim ki dolabın kilit yeriyle önceden oynanmış ve resmen elimde kaldı. Kahvaltı güzeldi. Saçma tipler yoktu. Lokasyon olarak da otobüs terminaline yürüyerek gidilmeyecek kadar uzak ama tarihi merkezi yürüyerek gezebilirsiniz. The location of the hostel is very good. You can do almost everything by foot. I didn’t feel so safe cause the door of the room was always open. I didn’t like the cleanliness of the hostel and the breakfast was very very simple. And also the shower of the hostel was horrible, they could be more careful with some details. Doors: creaky and loud. Woke everyone up when someone entered the room. They didn’t shut most of the time. No security apart from the main entrance of the building. Bathrooms: broken showers, taps, hair dryers clogged drains, super tiny stalls n just 4 bathrooms for such a big hostel. Toilets: very less, small and always dirty. Kitchen: dirty! Cooking area was always filled with unwashed utensils and some grease on the hot plate. Breakfast: good enough. Staff: really good and helpful!! It's finally come to this, I have to write a review on the website. The quick version: avoid like plague!! We booked 3 nights for 2 people during NY period, it was ridiculously expensive. We arrive and the receptionist make us wait forever, then when she finally proceeds with the check in, she charges us in the wrong currency. Many calculations later she gets the 'right' price but there is some extra taxes now. Place is dirty like hell, 3 working showers/toilets for lots of people. Unbelievable!